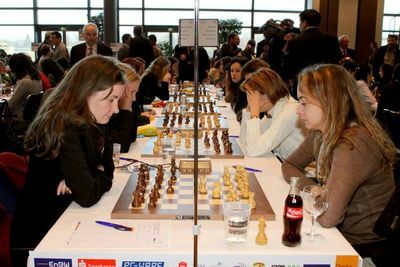 Chess Olympiad 2008 round 3 LIVE! Welcome to the day 3 live coverage of the 2008 Dresden Chess Olympiad. Here you will find minute by minute updates on the events in Dresden, underlining important games, bringing you fresh photos from the playing hall, explaining you the new Olympiad rules, sharing interviews, news, and many more details. A very interesting day awaits us at the 2008 Dresden Chess Olympiad. After 2 rounds of intensive matches Russia somehow does not convince they have a super team. At the same time Armenia and Azerbaidjan are cruising smoothly through the competition, while India is struggling, but yet winning. In total 20 teams have full match points in the open section, including Tajikistan, Faroe Islands, Japan, and El Salvador. In the women section the team of Russia seems unstoppable. Even though Slovenia put up a nice fight yesterday, the Russians are very balanced and deservedly lead the competition. 14 teams have full match points, the surprises being Germany 2, Denmark, and Venezuela. The Russian team keeps Kramnik on board 1 and substitutes Grischuk with Svidler. Morozevich is one more time a board up that the order list submitted, while the good performance of Jakovenko yesterday makes the Russian coach rely on him one more time today. Cuban best player, Leinier Dominguez, 21st in the world ranking, and with a 2719 ELO, drew with black pieces his rival Kaido Kulaots (2,556) in a very long match that lasted 94 moves. The same result was obtained by Cuban third player Yunieski Quesada in his match against Riho Liiva (2,460) that only lasted 7 and a half minutes. Cuba’s victory was secure with the wins of Lazaro Bruzon and Holden Hernandez, both playing with white pieces, who defeated GM Meelis Kanep and IM Olav Sepp, respectively. Indonesia is ver proud with the performance of their chess players as well. The Jakarta Post informs, “The Indonesian women’s chess team defeated Macau 4-0 in the opening round of the Chess Olympiad in Dresden, Germany on Thursday, but the men’s team went down 2.5-1.5 to Uzbekistan. Irene Kharisma opened Indonesia’s winning streak with a victory over Nicole Rio da Silva. Evi Lindiawati added to the success by beating Enerlan Salvador, followed by Desi Rachmawati and Dewi Citra who beat Lee Wing and Mak Kit Shu respectively. The Iranian press TV is on the opposite pole, as they report about the loss against France. “France has defeated the Iranian chess team in the men’s division at the 38th Chess Olympiad currently being held in Dresden, Germany. The four-member Iranian squad lost 3-1 to France in its second encounter on Friday evening. Iran drew 2-2 against fifth-seed Hungary in its opening match on Thursday and will now face Mexico on Saturday. One hour is left to the start of the round. Today the rule stating that players should be seated before the start of the round will be applied for the first time. Until now no forfeits have been given for that, but it is supposed to become as strict as the mobile phone rule. Today the long expectedappearance of two players will be a fact. The ex world champion GM Veselin Topalov will take board 1 for Bulgaria. They have a rather easy match against Nicaragua. Topalov will play against the 500 ELO lower rated IM Danilo Canda. Bu Xingzhi will appear as well. He will be on board 2 for China in one of the most exciting matches of the day. China will meet Norway, two teams that definitely can hope for a medal at this competition. The Armenian radio is praising both Armenia and Azerbaijan on their performance up to now in the Olympics. “After two rounds at the Olympiad in Dresden 20 teams have four points each, with Azerbaijan and Armenia leading on tiebreak points.” reports the Public radio of Armenia. Today Azerbaijan have a difficult game against the Netherlands, while Armenia meet Faroe Islands. 10 minutes to the start of the games and the playing hall is full of people as usual. WIll USA be able to recover from the difficult start? Can Russia defeat the enthusiastic Cuba? Will we see a surprise on the top boards in the women section> It starts very soon, stay tuned! And the games have started! The first forfeit of the day is a fact. FM	Hamperl wins against Ruzigura and Guernsey lead 1:0 against Rwanda. Today the players seem more comfortable with the crowd and are moving faster in the opening. Howell Shamel also opens the score of Barbados against the Seychelles. These countries do not have chances for the top places, but they can be proud they participate in such large chess events. What happened yesterday when you lost to Germany’s team B inlcuding your defeat by Arik Braun? I just played badly, after two hours I thought we would win by 3 or even 3,5 points but eventually the games toggled. Are you still playing the Sicilian Dragon? Did you play it already this year, can we expect a Dragon during the olympiad? (Smiling) Maybe, I don’t know whether I played it already this year. You played in German Bundesliga for a while. Yes, for six years. I played for Bochum and Castrop-Rauxel from 1996 to 2002. I also play in team national championships in Bulgaria, Croatia, Serbia, Austria and France. I am rather a team player than an individual chess player. Do you rather like condensed national championships where you play all rounds during one week or stretched throughout the year? I definitely prefer the condensed variation as you don’t have the hazzle with travelling all the time. That’s why I stopped playing in Bundesliga. Is there a goal set by your federation? Yo probably have the strongest Bulgarian team ever headed by the world’s top ranked player Veselin Topalov? There is no goal set, no pressure. But we will earn more money if we get a good rank in the final table. Kramnik and Dominguez Perez have blasted 10 fast moves, but the Cuban player seems surprised by the opening as he is taking more than 15 minutes on move 11. Kramnik is playing Russian System against Dominguez’s Gruenfeld defence, Bruzon – Svidler is Ruy Lopez. Morozevich is playing very popular Capablanca system against Quezada’s Nimzo Indian, Hernandez and Jakovenko already exchanged Queens in the Slav opening. India is holding stable against Russia in the women section in the opening of the games. 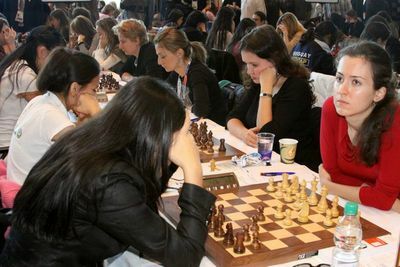 GM Stefanova is back for Bulgaria after yesterday her country did not perform well. Panama are the first ones to score in this section, taking the lead againsAfganistan 1:0. In one of the top games of today Van Wely and Radjabov have been constantly trying to find tactical blows. They have already blasted over 20 moves and the position is very peculiar – Van Wely has a wide open king and a bishop more for two queenside pawns of Radjabov. Norway and China prove to be one of the most interesting matches of the day. Wang Yue – Carlsen is Capablanca variation of the Nimzo Indian, but somewhat more active for Black, compared to Morozevich game. Agdestein sits out, so K.Lie takes up on the second board. He is playing relatively harmless line against Bu’s Caro-Kann. Black is already equal. Third board is Johannessen wrote a book on the Zaitsev variation of the Ruy Lopez, but he is now engaged in some sort of Anti-Marshall against Ni Hua as Black. Jon Ludvig Hammer is playing Anti-Gruenfeld against Li Chao. In the same line David Howell won quickly as Black the other day. Van Wely and Radjabov continue theoretical discussion in an extremely sharp line of the Kings Indian defence. Radjabov sacrificed a piece for two pawns and attack – Van Wely’s King is pushed back into the center of the board. Make sure to check out this game, interesting action is coming. Kramnik seems to know what he is doing. He has more time on the clock than when he started, and Dominguez Perez is obviously surprised. He is losing time on each move and is down to 40 minutes. Could this be the first win for Russia on board 1? IM	Ismagambetov opens the score for Kazahstan against Jordan. Guernsey and Barbados close out their games with fast victories. Iran have an easy game against Botswana in the women section and WIM	Pourkashiyan opens the score. 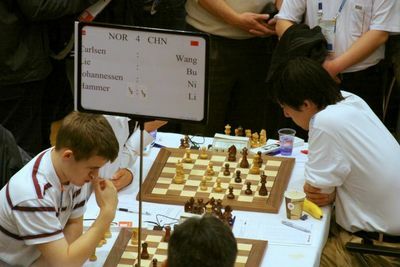 Wang Yue and Carlsen are playing a balanced game. Although there is a lot more left in the position, lower boards will surely be vital for the outcome of the match. Armenia open the score against Germany 2.This looks an easy match for the strong armenian team, after on board 1 IM Danielian Elina defeated Judith Fuchs. FM	El Debs Felipe De Cresce scores a full point for Brazil against Mauritius. 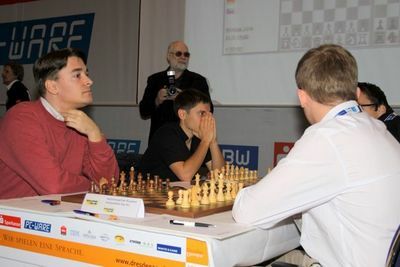 GM Fabiano Caruana has just won a wild game against GMDe La Riva. Finally things look fine for Italy, who have been suffering a lot in the first rounds. Cheparinov makes it count for Bulgaria on board 2. Topalov does not seem to have problems in his game and very soon Bulgaria might get their first convincing victory. In an interesting game GM Judith Polgar draws with GM Viktor Laznicka. Surely there was more in the position, but they agreed to split the point on move 30. GM	Akopian does well on board 1 and wins against IM	Ziska. Armenia will keep being top of the table, surely watching the performance of Russia, Azerbaijan, and the other top nations. GM	Nisipeanu breaks the long run of draws and scores a full point against Kojima Shinya. Japan were doing great until now, but it looks Romania will walk away with an easy two match points. GM	Movsesian brings a full point for Slovakia as well. Imprecise play by GM Ivanhcuk gives Jobava a decisive advantage. Ivanchuk made a piece sacrifice right after the opening, however, there was no reasonable compensation. This can make the day of Ukraine difficult, as Georgia is doing fine on the other boards. At the same time Topalov has comfortable advantage both in time and his position, while the youngsters fight between Li Chao and Jon Ludvig Hammer ends in a draw. Germany 1 is stronger than ever.GM Baramidze opens a decisive gap with a victory over IM Liew Chee-Meng-Jimmy and Germany 1 are set one more time to stay among the leaders. GM Gashimov and GM L’Ami draw their game. The result of the match very much depends on the theoretical battle between Radjabov and Van Wely on board 1. India wins their match with victories by GM	Geetha and GM Sandipan, and a draw by GM	Harikrishna against a 300 ELO lower rated opponent. GM	Le Quang Liem and CM Nguyen Van Huy give the victory of Vietnam against Luxembourg. A quick look at the women section gives us many matches that have quickly come to a decisive end. Still no score in India – Russia though. The PR manager of GM Topalov has just given an interview for Focus news agency. He says, “Yesterday was the deadline for the decision of the match, yet we still have no information about that. It is clear that Topalov has confirmed his participation, but has Kamsky done that? I guess we will know this later today or tomorrow. I hope FIDE understands that nothing can be expected from Ukraine”. 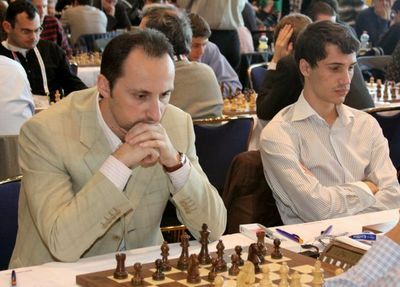 At the same time Topalov sealed his game against Nicaragua and Bulgaria is leading 3:0. Uganda is the first team to be disqualified at the 2008 Dresden Chess Olympiad, informs Susan Polgar. As reported earlier, the Chief Arbiter and the Organizer decided to only give warnings to players / teams which were late in the first two rounds. They clearly said that they will STRICTLY enforce this rule starting round 3 and they kept their word! For more info check out the 14:00 CET update. Georgia stun Ukraine! The surprise of the day! USA take convincing victory in the women section, despite the surprising loss on the last board. 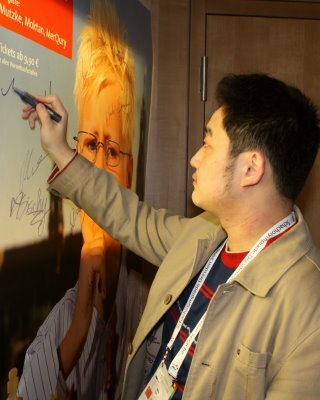 Magnus Carlsen makes the day of Norway with a very difficult draw against Wang Yue. Norway wins and shows their ambition for medal! India! India! India! The young team of India is on the way of bringing down Russia! 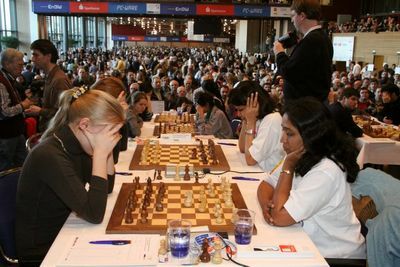 It all started with Tania Sachdev winning against Kosintseva and WGM	Swathi stunning IM Korbut. Now it is all up to Mohota. The Azerbaijan – Netherlands derby finishes peacefully after fierce fighting. Van Wely brings the point to Netherlands. Time trouble in Kosintseva – Mohota! India have a drawn match in hand and can make it count. In the men section easy victory for India over El Salvador. Believe it or not, Monaco holds the Philippines! They surely were missingWesley So. Fresh from Dresden. 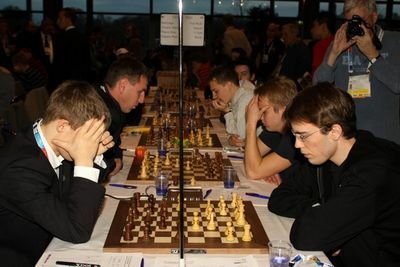 In the third round of the 2008 Dresden Chess Olympiad, the U.S. team faces South Africa. On board 3, GM Shulman has made an official complaint about a clock situation. He made a move and pressed his clock. 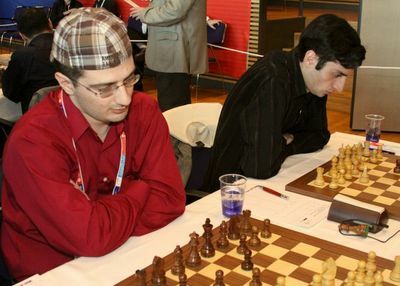 Unfortunately, his time was still running, informs GM Polgar. When he discovered this glitch, he reported to the arbiter and the clock was replaced. But the same problem continued. Now he is asking to be moved to a different board because he believes that the board which connects to the clock is malfunctioned. Sweden wins against Lebanon 3:1, but Emanuel Berg has third loss in a row. Today it was against 300 ELO lower rate opponent. Sweden will probably give him a rest day tomorrow. IM Haddouche stopped Serbia to a draw and their Olympic dream for a medal is over. They will need to do a lot better in the next rounds to enter the top places. Another big surprise in the women section! Greece lose to Indonesia. On the question from many readers: India – Russia in the women section was a draw after Nadezhda Kosintseva won against Nisha Mohota. Still a very good performance by India, surely the surprise of the day. Russia remain clear favorites though. Important update. The live transmission of the official site seems to have messed up Georgia vs Ukraine (special thanks to Dambi for notifying us). Official sources from Dresden confirm that the last game Arutinian – Volokitin was won by the Ukranian and Ukraine is the winner of the match. Stay tuned for more details, we are researching the case. This puts tomorrow on the top board Armenia vs Ukraine. Aronian is expected to be back on board 1 for a heavy match with Ivanchuk. Spain will face Germany, Russia will play with India. Refresh the page to get the latest updates, photos, and news from Dresden.